University of California Irvine – B.A. Mrs. Burns attended UC Irvine and graduated with a Bachelor of Arts degree in Political Science and a minor in criminology. During law school, she was a member of the Entertainment and Sports Law Society and Secretary of the Black Law Student Association and Alliance. Although she was admitted to practice law in 2012, Mrs. Burns has worked in the legal field since 2004. In 2006 she was chosen, out of several hundred candidates, to intern for a highly prestigious workers’ compensation law firm in San Francisco, which represented law enforcement, firefighters, and other rescue personnel of Northern California. Mrs. Burns has represented a wide array of clients, including world-class professional athletes and members of the Saudi Arabian royal family. She has also worked directly with multinational corporations and manufacturers, such as Nike, Adidas, Oakley, and Gatorade. Since she began practicing in 2012 she has participated in several trials and obtained numerous successful verdicts and settlements in the area of family law. In 2015 she was awarded “Lead Counsel Rated” in the Family Law specialty by the Lead Counsel Review Board. Although she stopped practicing in the area of family law in January 2016, her everlasting tenacity to adamantly represent her clients continue to show. Mrs. Burns was awarded the 2017 “10 Best Attorneys” and “10 Best Female Attorneys” for California in Client Satisfaction by the American Institute of Family Law Attorneys. She was also awarded the Top 10 Family Law Attorney for 2017’s Attorney and Practice Magazine. This award is an achievement reserved for only those attorneys who have demonstrated the highest degree of excellence in their area of law, with less than 1% of attorneys nationwide receiving this award. 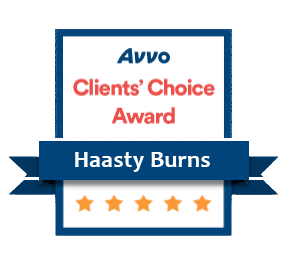 Additionally, Mrs. Burns was also recently awarded with the 2017 “Lead Counsel Rated” in the Civil Law specialty by the Lead Counsel Review Board, the 2017 Avvo Clients’ Choice Award and 2018 “10 Best Attorneys” for California in Client Satisfaction by the American Institute of Personal Injury Attorneys.